Sometimes I think that maybe September is the wrong month to finish knitting a nice wool sweater. Why? I am finding myself wishing away whatever remnants of Summer weather are still remaining. That’s kind of a shame, when you think about how many months I spend eagerly anticipating that exact weather! Here it is, 7:30pm on the first weekend of fall, and I have the back door wide open. Several windows, too. It’s a lovely, lovely night. But I can’t help but wish that maybe it could be a teeny weeny bit chillier so I could put on my new sweater. I’m stubborn, so I’ve worn it a few times anyway. And of course I was too warm with it on. But hey, it makes me feel good to be out and about in a new garment that I made myself! Especially one that involves so many bits that I designed myself. I can’t really say that this is a Tea Leaves Cardigan anymore, when I’ve replaced so much of it with my own ideas. It’s kind of a hybrid. A stepping stone to a fully Lisa-designed sweater (oh, yes, it is coming, my friends – I already have ideas for further customizing this bad boy). This was the fastest sweater I ever knit. Usually, they take me about a month. This one? 18 days. Whoa. I wonder if I’m a speedier knitter than before? Whatever the reason, I’ll take it. I am enjoying comparing it to the other two. Notice how the first two have the same yoke? Or how the last two have the same hem and cuffs? How about a tour of some details? I’d love to share the entire pattern for this sweater, but since there are big sections of it that are just the exact Tea Leaves Cardigan pattern, I really can’t do that. What I will do is share the changes I made to that pattern. If you already own it, you can just plug my changes right into it. If you don’t own it, but want to, here is the Ravelry link. One set of 5 US #7 double point needles. One US #8 (5mm) 32″ circular needle. One US #7 (4.5mm) 32″ circular needle. One US #6 (4mm) 32″circular needle. One US G (4mm) crochet hook. 20 sts and 24 rows = 4 inches (10 cm) in stockinette stitch with #7 circular needle. Chest: 34 (36, 40, 42, 46, 48)”. (I made the 40). With #6 circular needle, cast on 90(90, 96, 96, 102, 102) sts. Do not join. Rows 1-6: Knit all sts. Rows 7-11: With #7 circular needle, purl all odd rows and knit all even rows. Row 12: (RS) (yoke increase row) *k1, k1f/b repeat from * across entire row. 135(135, 144, 144, 153, 153) sts on needle. Row 14: With #8 circular needle, *k2, p2, repeat from * across entire row. (It is alright not to end on a purl). Rows 15-20: Knit all knit sts, purl all purled sts. Row 21: With #7 circular needle, knit. Row 22: (RS) (yoke increase row) *k2, k1f/b repeat from * across entire row. 180(180,192,192,204,204,216) sts on needle. Row 24: With #8 circular needle, *k2, p2, repeat from * across entire row. (It is alright not to end on a purl). Rows 25-30: Knit all knit sts, purl all purled sts. Row 31: With #7 circular needle, knit. Row 32: (RS) (yoke increase row) *k3, k1f/b repeat from * across entire row. 225(225,240,240,255,255) sts on needle. Row 35: *K9(9,9,4,4,4) k1f/b* repeat from * to * across entire row. 247(247,264,288,306,306) sts on needle. Work back and forth in stockinette stitch until yoke measures 7.5(8, 8.5, 9, 9.5, 9.5) inches. On next RS row, separate sleeves. Where you are instructed to do a number of rows in garter stitch, disregard and work 10 rows of k2 p2 rib. Before working this section as written do the following: with G hook, sc into each stitch across neckline. I made these from polymer clay (as usual!) but they’re much simpler than the last few times. I mixed up an orange to match the sweater, and swirled in a little bit of yellow, since there is also a bit of yellow in the heathered yarn. I used small cutters to cut these out, poked pilot holes, and rubbed a small amount of gold metallic powder over the tops of them. After baking, I drilled more uniform holes, lightly sanded off much of the gold powder, and buffed them on the buffing wheel. I’m happy with the results, although they might be a smidge brighter than I wanted. 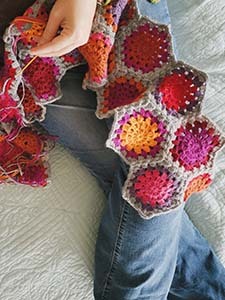 I would rather learn to love them, though, than have to sew on a new set (I hate sewing on buttons!) so they’re staying. And that’s that! My new September Sweater. I am in love. Basking in the glow of this sweater, I have already started thinking about the next one. Gray and black stripes would be kind of cool, don’t you think? Maybe I need an October Sweater. Hee hee! P.S. Here’s the Ravelry link, if you like. UPDATE: I started from scratch and wrote up an entire pattern/tutorial for a sweater very similar to this one. You can get it in the Download Shop. Thanks for your interest! I have to say, I think I like it best with your yoke. Lisa, when you rewrote the pattern with the new ribbing in the yoke (instructions above), why did you not include the button band? No worries 🙂 Happy knitting! I agree with Kat, I much prefer the look of your yoke. I must do this sweater! Well, that’s cool to hear. If you do try it, let me know if you have any problems with my changes! As for the gray and black idea, I feel like I need a neutral in my closet. I have this great gray wool that actually, when you look at it more closely, has about a million other colors in it. I thought I’d make a sweater that was mostly that, but had a black stripe or two in the yoke. And maybe the cuffs. Great job, Lisa! I like this yoke a lot. Plus, I really think this is your color. You look radiant in this sweater. Ditch green and go bright! HAHA. But then again black & gray stripes sounds pretty cool, too. Ditch green? Never!! LOL! Thanks for the complement, though, and I do really love the way this color looks on me. I had forgotten how much I love the Autumn colors. I used to wear a *lot* of oranges before the green craze hit me somewhere around 15 years ago. It turned out beautiful! Love the color, perfect for fall and winter. What is next on your knitting radar? I scored 10 skeins of Donegal tweed at the thrift shop this weekend, and I cast on for a Shalom cardigan, but it looked terrible after 10 rows. So, I’ve put that away for now. I have some gray wool that I think will become an improvised cardigan soon, providing I don’t get sidetracked by lots of little projects (which might just happen, with Christmas right around the corner). Stunning!! I love the colors and the buttons work really well. They really make the sweater pop. Very nice, a job to be proud of, congratulations! If you’d like to enjoy your sweater more during the warm weather, I suggest using a padded hanger to display it in, say, your bedroom or even the front hallway. Why not? Thanks, Jamie. I have to admit, I haven’t worn either of the other two since I finished the orange one. Maybe it’s the lure of the brand new, or maybe I just like it better. It’s hard to say! Turned out great!!! Great color, and I do like your changes to the pattern better. Continues to motivate me to not give up on learning to knit. On a side note, I’m almost done with the lake forest blanket! Yay! Aw, thanks! I am so glad I decided to try the ribbing! I love it. It looks great on you and I love the color. While you enjoy the fall weather, enjoy your sweater as a piece of art until you need it for warmth. Polka Dot Cottage: Would you like to knit an Everyday Cardigan? Lovely cardigans…I am tempted to knit one too! I haven’t seen the pattern to which you referred, but I LOVE this sweater. I already have the right amount of yarn I purchased on yarn.com for “some future project” – but it was on sale – so I am printing up these instructions and will begin promptly after my Christmas knitting is finished. That would be 2 more hats. Love this pattern. Thank you so much for sharing. I can’t wait to make this sweater! And it will be even more special since I have a niece who is named Lisa Clark. She was Miss Honolulu when Miss Hawaii won the Miss America contest! Maybe I will make one for her. Thanks for sharing your talents with the world! I hope you love it! My version is still one of my favorite cardigans to wear.